This is probably the single finest existing 1821 half eagle and is one of only two known Proofs, the other in the Smithsonian Institution. 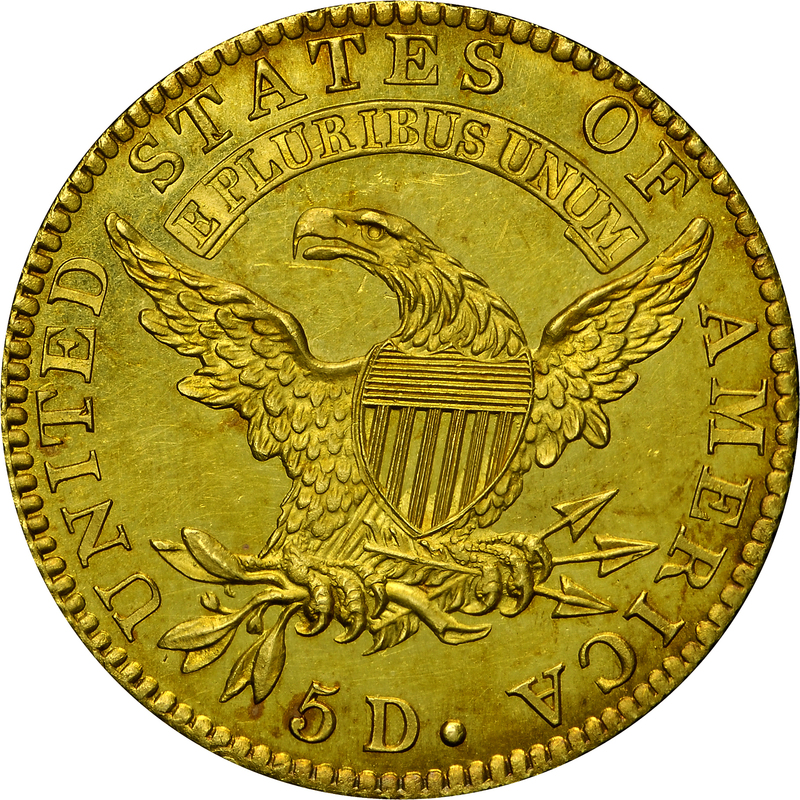 This example was formerly the property of William H. Woodin and was plated in the 1914 Exhibition Catalogue published by the American Numismatic Society. 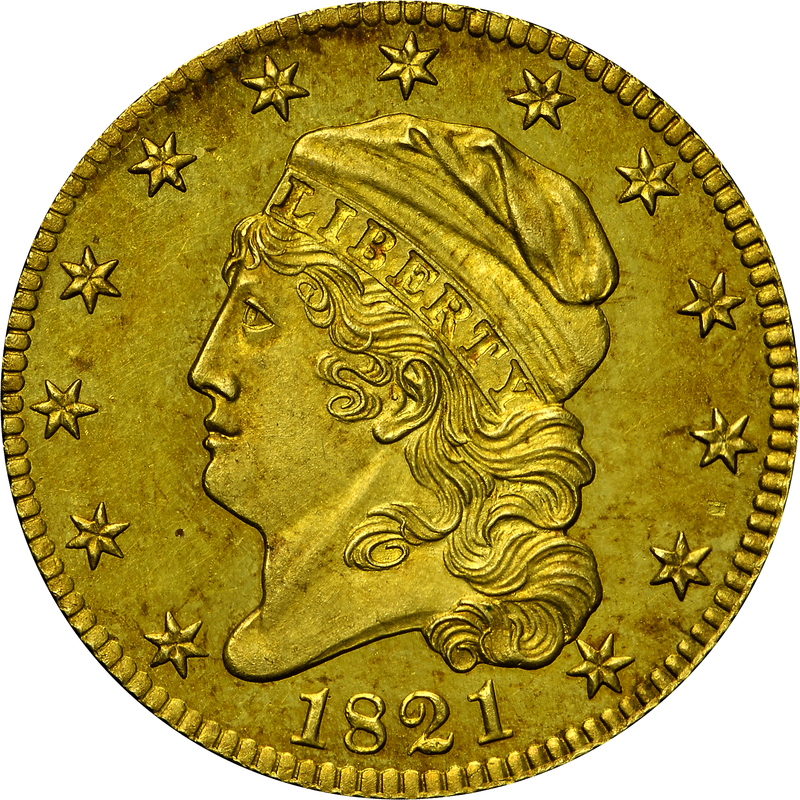 The following year, 1822, featured a recorded mintage of 17,796 coins according to Mint records. There are only three known examples bearing this date with two of those in the Smithsonian Institution, the third in a private collection. This is the only early gold coinage date not represented in the Bass Collection. From the Bowers and Merena Galleries sale of the Norweb Collection, October 1987, Lot 773. Earlier from the Randall sale, 1885, Lot 927; William H. Woodin; Waldo C. Newcomer; Colonel E.H.R. Green; B.G. Johnson; King Farouk; Sotheby's sale of the Farouk Collection, February 1954, Lot 237. "Obverse: Curve-based 2. Belted 8. Star 13 just touches hair, point pointing to a denticle. 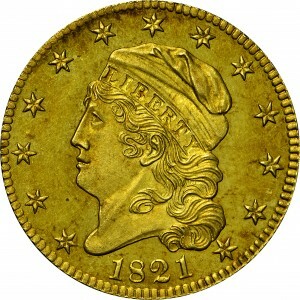 Reverse: That of 1820E. Large letters. 'Punched' T (letter T has a triangular punch in bottom of upright). S over E and space right. T over R and space right. S over S and space left. Base of E in line with that of adjacent T. Perfect M. Close 5D, top of 5 even with that of D. Large period. Tip of bottom arrowhead immediately below right base serif of I (distinctive)."